We have all come across stories of tenants who have destroyed properties or failed to pay their rents. A bad tenant is generally considered to be a nightmare for any landlord both emotionally and financially. Fortunately there are many steps that the landlord would take in order to avoid being put in this state. With the right tenants being screened in place the landlords could here detect the bad tenants before it turns out to be really very late. Given here are the 5 major tips that would help you conduct a tenant background check with total confidence before it turns out to be late. Making the tenant fill out the tenant application form: The first step that you need to take as a real estate investor is to compose a written application. A completed written application would give you the relevant information you need in order to make a confirmed decision. Verifying the landlords name using proper channels: One of the best ways to do this to get your Realator or lawyer to conduct a land registration check on the various addresses belonging to the tenant’s current and previous landlords. And if the names provided match with those being listed on the land registry then the tenant has been honest enough in forthcoming about the required information. Warning the applicants: Warn the applicants that you would require a tenant background check before they begin to apply for your property. Also it would be really good if you could point out at the false statements on the rental applicants who constitute fraud. This in turn would scare away the scammers who could find targets at a great ease. Confirming on the current rental period: When the tenant lies about their current landlord preference, then they are also lying about the time period during which they rented their current home. 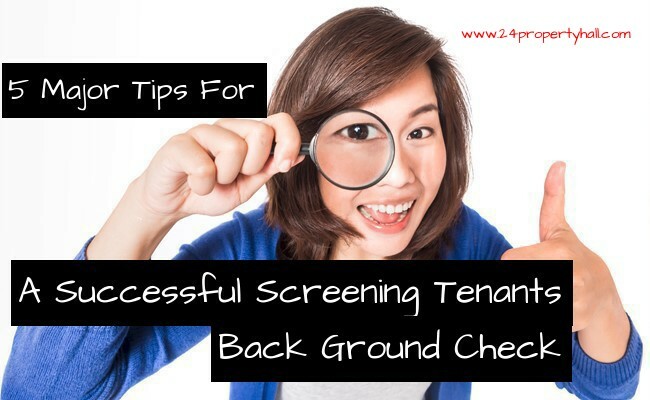 Having a robust tenant background check would here attempt you too detect on the multiple levels in order to lessen the probability of approving a bad tenant. Pulling out your own report: In many of these years of being a realtor or a real estate investor all of us have come across many fake credit reports of a real estate industry. This is why it is always advised to the landlords to pull out a second credit report on tenants whom they are seriously considering. This again has to be started as a standard protocol with respect to any tenant background check. So before you approve a tenant you should get a third part in order to pull a credit report for you, without relying on the credit report you have received from the tenant. So once you have going to make a decision in the favour of a tenant it does become important to pull out all their credit report in order to see if there are things that matches. To conclude by covering all the bases you could now ensure that you would not just have the best tenants for you and your rental property, but also that your tenants being protected. Seema Mohta has over 7 years of experience within Real Estate Industry. She has worked with Various Real estate companies and has Good knowledge about property trends,Investments, Residential 2bhk flats,Residential projects etc.